As Jesus walked on earth, he constantly challenged people's expectations of what God was like. When they were willing to open their eyes, they found a King unlike any they'd ever known... One who would change everything and finally save them. Thousands of years later, we are on the same journey. As we read about what Jesus did and said, we're confronted with the same questions. If our King has come, what does that mean for our lives, whatever stage of life we're at? 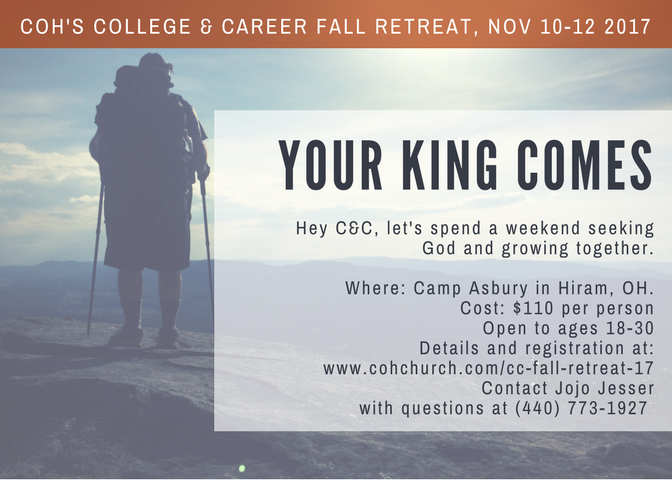 The C&C Fall Retreat is an awesome chance to spend time away from your normal school/work routines to make space to work through these questions, seek God, and grow together in a fun, relaxing environment. -Good food, good conversations, music, campfires, hiking, the chance to take on a high-ropes course together, lots of laughter, time spent seeking God together, and chances to draw away to pray/reflect by yourself. Friday, November 10 through Sunday, November 12. We will depart from COH at 4:30 PM on Friday and return by 12:30 PM on Sunday. Camp Asbury in Hiram, Ohio. We'll be staying in a comfortable lodge and making the most of their beautiful camp grounds! We'll meet at COH and carpool over to Camp Asbury! If you're interested in being a driver, you can indicate that on the registration form below. Open to anyone ages 18-30. Whether you're a regular Monday night C&C attendee or just heard about our retreat from a friend, you are welcome to join us for this weekend. We'd love to have you. Cost for the whole weekend, everything included (transportation, lodging, food, activities, etc.) is $110.00. Scholarships are available if needed, please indicate on the registration form below. Fill out the form below. The $110 payment can be turned in anytime before the retreat or brought with you that weekend. Checks should be made out to Community of Hope Church.